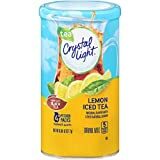 Crystal Light Iced Teas are low-calorie tea drink that come in both a powdered drink mix and a ready-to-drink form. The Ready to Drink bottles are 16oz and 22.5mg caffeine in them. A normal stick of Crystal Light Iced Tea powder mixed in 8oz water will have 11.25mg caffeine. The drinks are sweetened with aspartame. CITRIC ACID, MALTODEXTRIN, INSTANT TEA, CORN SYRUP SOLIDS, ASPARTAME, CONTAINS LESS THAN 2% OF NATURAL FLAVOR, MAGNESIUM OXIDE, ACESULFAME POTASSIUM, RED 40 LAKE, RED 40, YELLOW 6 LAKE, YELLOW 5, BLUE 1 LAKE, BHA (PRESERVES FRESHNESS). How Does Crystal Light Iced Tea Compare? Crystal Light Iced Tea contains 1.41 mgs of caffeine per fluid ounce (4.76mg/100 ml).